When Chris and I returned from our amazing Alaskan cruise, I blogged a ton of photos of course, but it occurred to me that I didn’t write much about the cruise itself and I figured that kind of information might be helpful to anyone looking to see Alaska via cruise ship. Plus it’s fun for me to reminisce about our amazing trip! 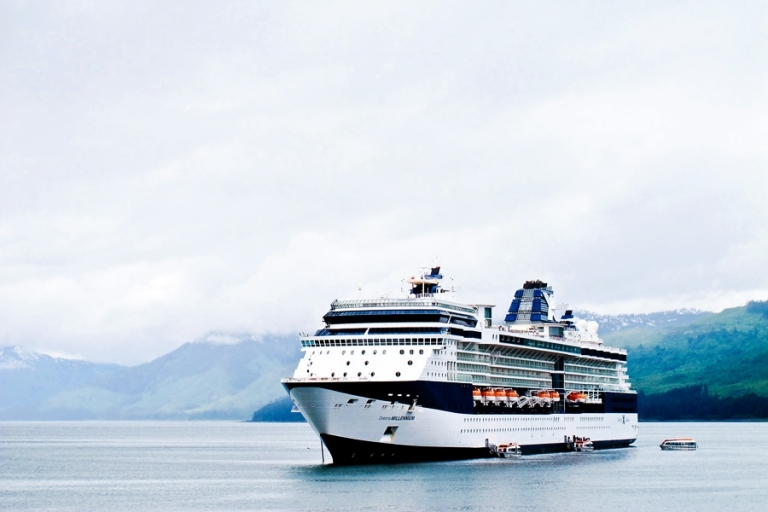 When we were researching all of the different cruise lines that sail to Alaska, we decided that Celebrity fit our needs. Our requirements for the cruise itself weren’t too extensive because our main priority was seeing and exploring Alaska, but we did want a quiet place to sleep, a few choices for decent food since several meals would be at-sea, and an itinerary with several ports that also included a close-up experience of Hubbard Glacier, North America’s largest tidewater glacier. At the time of my research, I found information on cruisecritic.com (an awesome resource for cruise reviews and info) that suggested the average age group aboard a Celebrity cruise is typically 30-50 or honeymooners through baby boomers, so we fit the demographic. Not that age was a huge factor for us, but we weren’t really looking for crazy nightlife or family activities. Really the cruise was just a floating hotel room for us, so we didn’t need a ton of amenities, although Celebrity had plenty to offer (see below). We booked a one-way itinerary of the inside passage, the 7-Night Northbound Alaska Cruise, and set sail on the Celebrity Millennium from Vancouver. 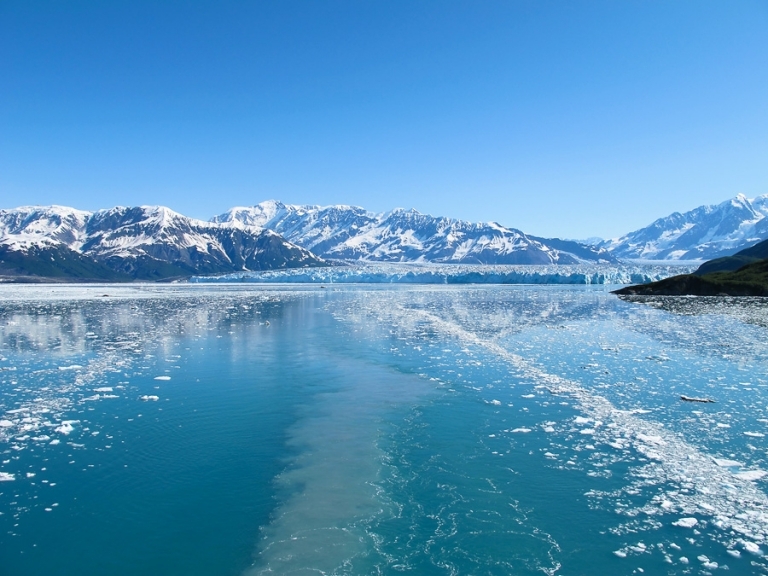 Our ports of call included, Ketchikan, Icy Strait Point, Juneau, and Skagway, and we also cruised to Hubbard Glacier. We disembarked in Seward, Alaska, where Chris and I rented a car and drove the incredibly scenic route to Anchorage for an overnight stay before our flight home. If you can do the one-way itinerary this way, I highly recommend it simply for the amount of scenery along the route and the opportunity to see some of the mainland state. The number of ports felt perfect, and the variety allowed us to experience a sample of small town life, wilderness, the capital city, stunning landscapes, and historical sites. We booked a few excursions through the cruise (ATV/zip-line combo, whale watching, and dog-sledding on a glacier via helicopter flight) and also a few on our own based on reviews and recommendations (kayaking and zip-lining). The activities booked through Celebrity were organized and well-planned, though maybe just a bit pricier than the independent operators, but everything we did was absolutely worth the price. More photos of those excursions are here and here, but if you have questions about any of these let me know! As I mentioned, one of our requirements was that we’d get a chance to see Hubbard Glacier. Our itinerary promised a visit to the glacier and an in-bay rotation of the ship so that everyone would have an opportunity for a close-up view. We woke up early on Thursday morning to the sound of the muffled loudspeaker in the hallway announcing our entrance into the bay where Hubbard is located. (Note: Celebrity is great about not blasting announcements around the clock, but this one was important and we were glad to hear it.) Being located in the aft of the ship, we knew we’d get a chance to see Hubbard during the rotation or at least upon exiting, so we stayed in our cabin in lieu of running up to one of the decks with the crowds. On the way into the bay, we were treated to the beautiful sight of huge ice chunks in the water. Bring warm layers for this event! This was the one time we were cold and had to bundle up. This was our view once the ship rotated and was making our way back out – in the first photo I included a bit of the balcony railing in view for perspective. Just breathtaking. We were close enough to hear the creaking of the ice as it calved and broke off into icebergs! It was an amazing experience not to be missed. Oh, a note on cleanliness. We boarded the ship to an announcement that our cabin wouldn’t be ready for a couple of hours due to an outbreak of the NoroVirus on the previous cruise. I’m sorry, what?! We’re expected to be trapped on this floating city with a gross virus and nowhere to hide?! As a self-proclaimed germaphobe, I freaked out. As in, get me off of this ship now. But Chris talked me down off the proverbial ledge. And Celebrity took extra sanitization measures including Purell stations at just about every entrance and hallway, including staff manning the dining room entrances dispensing mandatory Purell doses. We were all provided with instructions on how to best avoid the virus – mainly we just needed to wash our hands properly and frequently, which we certainly did and we thankfully never got sick. I also travel with Clorox wipes, virus outbreak or not, so you can bet I did additional cleaning on the surfaces in our cabin. By about the third day, the daily newsletter with health tips and victim statistics hardly phased me. Aside from that, we were impressed enough with the ship overall. Read on for more detail. Our cabin, stateroom 8172, included two twin beds pushed together, a fairly spacious seating area, teeny bathroom, small flat-screen TV, mini-fridge, and a gigantic veranda. As I understand it, the ship has been going through a renovation. I’m not entirely sure if any part of our cabin had been updated yet, but we didn’t find it to be horribly outdated. The decor was simple and tasteful enough, and everything was in decent shape at the time. The one thing that made our cabin special was the aft location. If you can book an aft cabin, I highly recommend it IF you aren’t prone to motion sickness. You’ll get amazing 180-degree views of your route and tons of unobstructed photo ops, but you do feel just a bit of the up-and-down motion more than you would in a mid-ship cabin. I’m a very light sleeper and the waves kept me awake the first night (which made me a difficult traveling companion the next day – I’m so sorry, Chris! ), but I discovered Dramamine which completely remedied the feeling for me. Our cabin also had the benefit of an oversized veranda, nearly doubling our living space. We rarely hung out on the open decks since we had so much space of our own. We spent every chance we could get being off the ship in port, but on days at sea, we took advantage of the theatre and some of the activities. We attended a fascinating lecture on Alaska’s wildlife, saw a well-produced tribute to Broadway musicals medley, a basic magic show (that I thought was so great, but Chris thought was cheesy – I was also pretty tipsy, so maybe that helps), and a really decent stand-up comedian. One night we went to a goofy-but-fun karaoke event in one of the bars. They also offered hobby-based classes, whiskey tastings, ship tours, and other events, all detailed in the daily newsletter sent to our cabin. The two areas that really shine (literally) are the spa and the casino. It’s obvious where Celebrity puts the most care in design and aesthetics. No surprise there, as I expect that’s a huge source of revenue for the ship since the spa services are sold separately, and we all know how the casino works. I quickly lost my preset max ($20) in about sixty seconds at the blackjack table. We didn’t use any of the services so I can’t speak to the quality, but the spa itself was gorgeous with panoramic views and the spa menu looked quite extensive. In general, the food ranged from okay to good, but nothing mind-blowing. There are plenty of opportunities to eat practically 24/7 on the ship, including buffets, specialty restaurants, the main dining room, room service, and snack stations throughout. (Although we aren’t really into stuffing ourselves unless the food is amazing.) We enjoyed a few of the dishes we had in the main dining room, but again, nothing super memorable as I’m writing this post. My understanding is that the best meals are served in the specialty restaurants, but dining in those restaurants comes at an additional price on top of the all-inclusive, and we decided to put our money towards experiences off the ship. Turned off by the potential for catching the virus, we also typically avoided the buffets. Everything looked clean and fresh though, and there seemed to be a decent variety of options. We also opted not to purchase the alcoholic drink package, but we frequented a few of the bars for expensive-but-tasty cocktails. We absolutely loved the quality of service. Our cabin attendants and servers in the dining room always blended the perfect combination of available when needed, and invisible when not needed. We didn’t really need anything special so I can’t say we put them to the test, but we never encountered a single member of the staff and crew who weren’t polite, professional, and hospitable. This was one of our favorite trips to-date, with Alaska as the shining star and the cruise as the subplot to the story. We aren’t really cruise people per se, but it’s definitely an easy, comfortable way to see a huge sample of everything that this beautiful state has to offer. 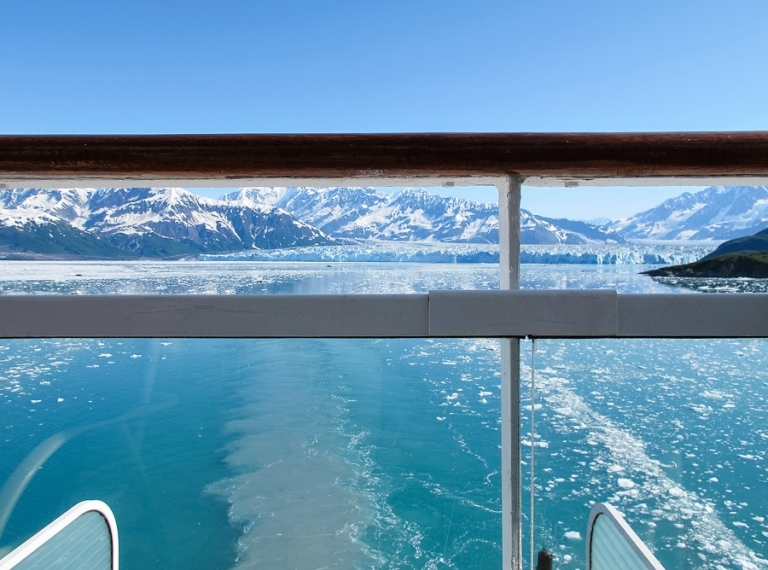 I’ve only ever heard people say wonderful things about their cruise to Alaska, and we’re no different. If we have a chance to go back, we would definitely fly directly to some of our favorite places and/or explore new ones, but the cruise is what gave us the opportunity to see the overall big picture of Alaska. We’re glad we took the cruise approach. We’re definitely considering cruises for a few other trips where we’d like to see a sampling before deciding where to return for a more in-depth stay (e.g., some of the islands in Asia). I would highly recommend the Alaskan cruise to anyone who loves adventure, history, nature, scenery, and/or photography, and I’d absolutely sail the Millennium again. She just might be the one to take us around Southeast Asia. Just one last tip, Chris and I flew to Vancouver one day before the cruise was scheduled to embark to account for any flight delays, weather-related issues, traffic, or other mishaps. Even if you calculate that you’ll have plenty of time to get to the dock from the airport, having a 24-hour buffer (approximately) is a huge nice-to-have in the case of something like lost luggage. We felt like it was better to be safe than sorry and we didn’t want to miss any part of the cruise. And as a bonus, flying into Vancouver early helped with jet lag. Let me know if you have any questions about the Celebrity Millennium or Alaska! I’d be happy to help.